Reading and share top 42 famous quotes and sayings about Tethered by famous authors and people. 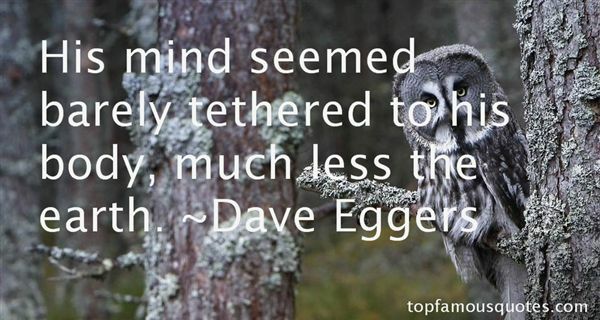 Browse top 42 famous quotes and sayings about Tethered by most favorite authors. 1. "Her purse was a weight, ballast; it tethered her to the earth as her mind floated away." 2. "Even her name seemed empty, as though it had detached itself from her and was floating untethered in his mind. How am I supposed to live without you? It was not a matter of the body; his body would carry on as usual. The problem was located in the word how: he would live, but without Elspeth the flavour, the manner, the method of living were lost to him. He would have to relearn solitude." 3. "We'd both been stripped of all the evasiveness, all the lies, everything we'd ever kept from each other. Layer by layer, we had given up our defenses and our excuses and our demands for whys and hows, and what was left were two broken beings. Clinging to one last shred of hope. Tethered to each other." 4. "Tessa had lain down beside him and slid her arm beneath his head, and put her head on his chest,listening to the ever-weakening beat of his heart. And in the shadows they'd whispered, reminding each other of the stories only they knew. Of the girl who had hit over the head with a water jug the boy who had come to rescue her, and how he had fallen in love with her in that instant. Of a ballroom and a balcony and the moon sailing like a ship untethered through the sky. Of the flutter of the wings of the clockwork Angel. Of holy water and blood." 5. "When she had died, his anchor was gone and the world had burned from his untethered insanity." 6. "Imagination might not be limitless. It's still tethered to the universe of what we know." 7. "It had not been a long journey, but the memory of it filled her like an infection. She had felt tethered by time to the city behind her, so that the minutes stretched out taut as she moved away, and slowed the farther she got, dragging out her little voyage." 8. "His mind seemed barely tethered to his body, much less the earth." 9. "The Pension Dressler stood in a side street and had, at first glance, the air rather of a farm than of a hotel. Frau Dressler's pig, tethered by one hind trotter to the jamb of the front door, roamed the yard and disputed the kitchen scraps with the poultry. He was a prodigious beast. Frau Dressler's guests prodded him appreciatively on the way to the dining-room, speculating on how soon he would be ripe for killing. The milch-goat was allowed a narrower radius; those who kept strictly to the causeway were safe, but she never reconciled herself to this limitation and, day in, day out, essayed a series of meteoric onslaughts on the passers-by, ending, at the end of her rope, with a jerk which would have been death to an animal of any other species. One day the rope would break; she knew it, and so did Frau Dressler's guests." 10. "Tethered heart, free spirit.--If one tethers one's heart severely and imprisons it, one can give one's spirit many liberties." 11. "Josh joined her at the window. She let him look. He should know that the world was not all lessons and iguanas and Nintendo. It was also this muddy simple boy tethered like an animal." 12. "He smiled. I was unprepared for my reaction to the most potent weapon Haden had in his arsenal—a real smile, one that reached his eyes.One genuine emotion was enough to unravel my life from the security of everything I'd ever known.For seventeen years, I'd tried to live Father's way. Each step measured, my words carefully chosen. In his fortress of fears, I grew up—but not strong. I yearned to replace the hole in his heart left by my mother, so my life never belonged to me. My own heart was my weakest muscle, never exercised, never even flexed.Suddenly, I understood that it still miraculously worked. And it was full. So full it felt like rays of sunshine were bursting through my chest, poking out of me in radiant splendor. Haden spellbound me and life changed to Technicolor. In his smile, I felt the bindings that tethered my spirit rip away." 13. "As an artist, i live in fantasy and flirt with reality. I'm an emotional magician of sorts. I paint my feelings onto the abstract canvas of a waking dream. I suspend my concepts in the ether's of otherworldly realms. This is the way my existence has always been. I am untethered, a traveler between worlds. I sinuously slip in and out of the real and surreal, until, they are one and the same. I do not like being shackled or chained, to the physical plane." 14. "We must learn to cast off our anxieties because we have so many of them. The world destroys spiritual life by generating constant anxiety. Jesus said that the life of the gospel is choked out by the cares of this world. We know this to be true yet we are more chained and tethered to the world than ever before in the human race." 15. "Thinking is indispensable on the path to passion for God. Thinking is not an end in itself. Nothing but God himself is finally an end in itself. Thinking is not the goal of life. Thinking can be the ground for boasting. Thinking, without prayer, without the Holy Spirit, without obedience, without love, will puff up and destroy (1 Cor. 8:1).But thinking under the mighty hand of God, thinking soaked in prayer, thinking carried by the Holy Spirit, thinking tethered to the Bible, thinking in pursuit of more reasons to praise and proclaim the glories of God, thinking in the service of love--such thinking is indispensable in a life of fullest praise to God." 16. "How tall is it?" [The Harps]"according to the sagas, it links through time and space and keeps our world and your world tethered together""Pretty big, then"
17. "...as if there's some invisible string that kept us tethered the entire time he was away and that's tightening now..."
18. "ALL HE COULD SEE, IN EVERY DIRECTION, WAS WATER. It was June 23, 1943. Somewhere on the endless expanse of the Pacific Ocean, Army Air Forces bombardier and Olympic runner Louie Zamperini lay across a small raft, drifting westward. Slumped alongside him was a sergeant, one of his plane's gunners. On a separate raft, tethered to the first, lay another crewman, a gash zigzagging across his forehead. Their bodies, burned by the sun and stained yellow from the raft dye, had winnowed down to skeletons. Sharks glided in lazy loops around them, dragging their backs along the rafts, waiting." 19. "In awe, I watched the waxing moon ride across the zenith of the heavens like an ambered chariot towards the ebony void of infinite space wherein the tethered belts of Jupiter and Mars hang, for ever festooned in their orbital majesty. And as I looked at all this I thought... I must put a roof on this toilet." 20. "From two niches (to use Barber's word), North and South, we've splintered into hundreds of thousands, a nation of tribes connected not by kinship or even creed. We're merely tethered together by the Internet, by our brand loyalties and shared consumer obsessions." 21. "Jack had been a jerk that night, even though I tried not to remember that part. It felt like I wasn't missing him properly if I let myself remember how much I'd despised him sometimes. Instead I tried to remember what he looked like grinning and dirty in the driveway, though these days it felt more like I was remembering a memory of a memory of his smile instead of the smile itself. When I thought too hard about that, it made me feel weightless and untethered." 22. "Conservatism vests in and depends on the widespread, informed understanding of human nature, self-governance and the First Principle of Progress: free people interacting in free markets produce the greatest good for the greatest number always, but only, when tethered to virtue and morality." 23. "The clouds won't shatter my dreams, but this is a story about how I lost myself to the storm. ""And something's got me tethered to you...""Always to you...""They think I'm crazy... I love him. I swear, I do. ""Then why are you here, T? ""Esto es complicado, Eli. It's all the lies I made up to get away from you, the distance I drove to free myself, that's brought me here. It's that moment before your kiss and the sound of my name on your lips. It's you that's taken me the five miles I needed to be where you are. I won't run again. ""What are we doing? ""We're LIVING." 24. "Do you see that I cherish you beyond question, that you have nothing to prove to me? You are making your journey to secure yourself. I am already tethered to your side. if you can love yourself as I love you there will be no dislocation --- you will be whole. Bring yourself home to me and I will immerse you in very ounce of tenderness I possess. - Sabine Strohem"
25. "I stand here without rope or chains, Liv, tethered to you by my own will." His blood beat with the ferocity of his words. "I won't be free until you are." 26. "There were two separate and notable things that happened that evening, but they happened at the same time, and I do not feel it would write down properly that way, going back and forth, so what I will do is, spell out one, then the other. I always assumed that, in the few books I have read, the author had made some sort of attempt to squeeze real life between the covers. Now I see that this is not so: life is made easier to handle - blinkered, tethered and hobbled - before it is whipped into words and bound between leather." 27. "And Rose knows that dictionaries will never be the same again. Dictionaries will be forever imbued, sanctified, significant, suggestive. They will not be just themselves, but this moment, these moments, being here, like this, in this place, her and him, in this now. She will always have this now, tethered to Collins and Chambers and the Shorter Oxford." 28. "I'll give him the good Normal world where we're tethered beside them - blinking our nights away in a non-stop drench of cathode-ray over our shrivelling heads!" 29. "Technology is seductive when what it offers meets our human vulnerabilities. And as it turns out, we are very vulnerable indeed. We are lonely but fearful of intimacy. Digital connections and the sociable robot may offer the illusion of companionship without the demands of friendship. Our networked life allows us to hide from each other, even as we are tethered to each other. We'd rather text than talk." 30. "A human being can spend only so much time outside her comfort zone before she realizes she is still tethered to it." 31. "He tethered me to him, my magnetic north, while my mind went here or there. I always knew. Somehow I always knew." 32. "It's like being tethered to an angel. Hell keeps calling me but I can't let go." 33. "To be or not to be tethered to the sordid, sickly, stinking, sappy apron strings of Hollywood and its endless fondness for fu**ing your sh** up. If Shakespeare were alive today, I bet he'd write a scintillating soliloquy about the Broken Brood of Big Shots. I bet he'd help you out, Micky Affias, ol' Will the Bard would. Listen, we'll come visit you. Okay? I'll dress up as William Shakespeare, Lucent as Emily Dickinson, and beautiful ‘Ray' as someone dashing and manly like Jules Verne or Ernest Hemingway, and we'll write on your white-room walls. We'll write you out of your supposed insanity. I love you, Micky Affias.-James (from "Descendants of the Eminent")"
34. "I thought it such a shame that our culture had not devised a way to defang old age. 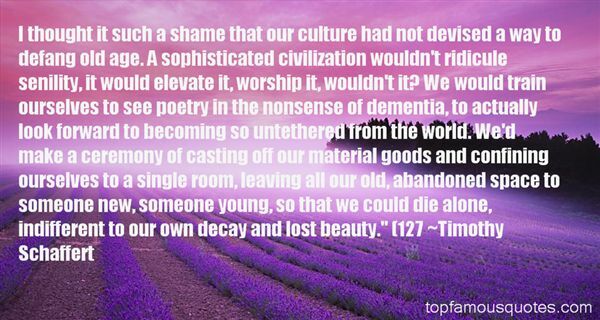 A sophisticated civilization wouldn't ridicule senility, it would elevate it, worship it, wouldn't it? We would train ourselves to see poetry in the nonsense of dementia, to actually look forward to becoming so untethered from the world. We'd make a ceremony of casting off our material goods and confining ourselves to a single room, leaving all our old, abandoned space to someone new, someone young, so that we could die alone, indifferent to our own decay and lost beauty." (127"
35. "And in all those escapes he could not help being astonished by the beauty of this land that was not his. He his in its breast, fingered its earth for food, clung to its banks to lap water and tried not to love it. On nights when the sky was personal, weak with the weight of its own stars, he made himself not love it. Its graveyards and its low-lying rivers. Or just a house - solitary under a chinaberry tree; maybe a mule tethered and the light hitting its hide just so. Anything could stir him and he tried hard not to love it." 36. "Amidst his chaotic thoughts, Ellis thought of Clairey's face, and he clung to that image. He conjured the radiant glow of her eyes when she was pleased with something, and the small, bashful smile that was fleeting but infinitely more priceless because of its rarity. Clairey's memory was the light that came on the heels of a black and starless night. She was the most beautiful woman he had ever known. It was more than her looks that drew him to this conclusion; it was her kindness, her strength, her spirit. Somehow, the thought of her tethered him to sanity." 37. "Always Sami. I was tethered to her somehow. To that scared little girl I'd found on the staircase nearly a year earlier; to the past, when teaching was simpler and I could care about everyday problems, when being relentless meant running two extra laps, not waiting for an MP to search the undercarriage of a bus for bombs before letting students approach it." 38. "We all lose people. We all have to live in the aftermath. It's how we move forward that counts, but sometimes we are tethered to something in our past that won't let us move forward." 39. "A kite only flies if it's tethered." 40. "And the boy whose temper seemed tethered to the air itself…they didn't know what to make of him." 41. "In the voyage of your worldly existence, the sails at which your life float upon, are tethered by the thoughts and emotions that which you harbor. Expand." 42. "Suddenly, over the slope, as if tethered to a cord of air drawing quickly upward, came a Northern Harrier, motionless but for its rising. So still was the bird - wings, tail, head - it might have been a museum specimen. Then, as if atop the wind, it slid down the ridge, tilted a few times, veered, tacked up the hill, its wings hardly shifting. I though, if I could be that hawk for one hour I'd never again be just a man." The only mystery in life is why the kamikaze pilots wore helmets."